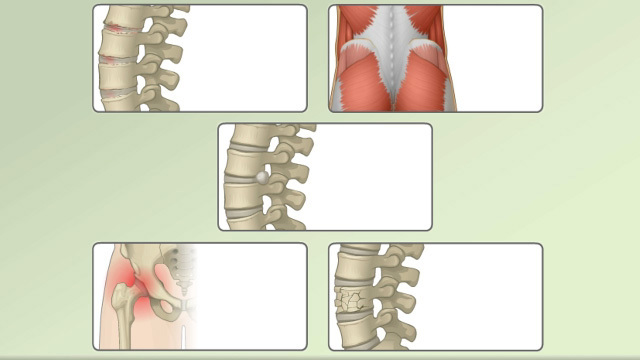 Which is the most common area for back pain? The correct answer is the lower back. The lower back is most likely to hurt because it supports your body's weight. You can help prevent low back pain by learning how to protect your back. Ask your health care provider about back-friendly ways to exercise, bend, and lift heavy objects. 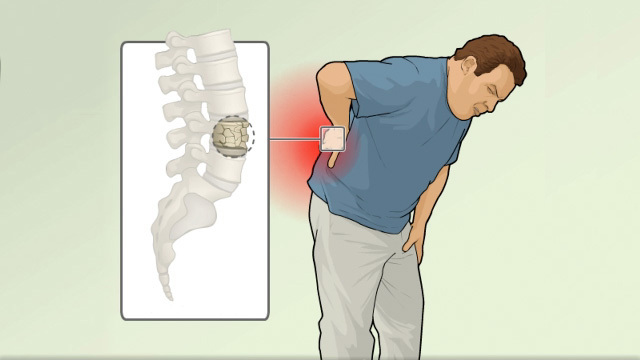 Which type of back pain is often caused by a sudden injury? The correct answer is acute. A sudden injury to the muscles and ligaments that support the back causes acute pain. 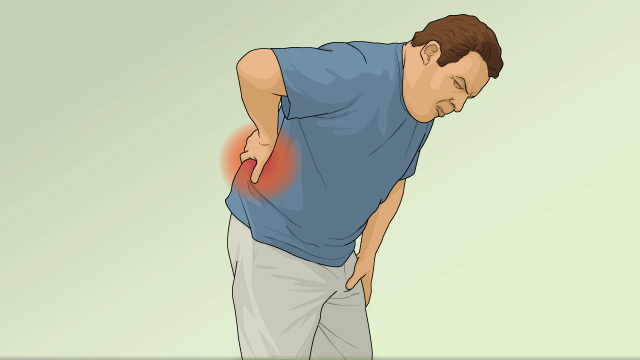 Chronic pain is present when your back pain lasts for longer than two months or continues to recur. Your doctor can help figure out what type of back pain you have and how to treat it. Most people with acute back pain feel better in four to six weeks. The correct answer is true. You should start to feel better after one week, and your pain should be completely gone in four to six weeks. To get better quickly, ask your doctor what you can do at home to help your back recover. Which is better to treat acute back pain? The correct answer is both. Heat, ice, or both help treat back pain. Try using ice for the first 48 to 72 hours, and then apply heat. If you hurt your back, you should rest in bed. The correct answer is false. Staying in bed can make back pain worse. You may want to take it easy for a day or two, and then slowly get back to your regular activities. You can start exercising again after about two to three weeks, but avoid heavy lifting or twisting for six weeks. If you recover more quickly, you be more active sooner. Which activity should you avoid until your back is healed? The correct answer is all of the above. Don't do any of these activities until your doctor or physical therapist tells you it's okay. You should also avoid weight lifting, racquet sports, sit-ups, and leg lifts when lying on your stomach. All these exercises can strain your back. People who smoke are more likely to have low back pain. The correct answer is true. You also may have a greater risk for low back pain if you are overweight, pregnant, don't exercise, feel stressed or depressed, are over age 30, or do a lot of heavy lifting or bending. Ask your doctor how to reduce your risk for back pain. Which of the following can help relieve chronic back pain? The correct answer is all of the above. Depending on what's causing your back pain, your doctor may recommend any of these treatments. A physical therapist can help you heal and recover from back pain. Massage may help ease tight muscles and acupuncture may reduce pain. Talk therapy can help you understand and deal with chronic back pain. You'll need prescription medicines for acute back pain. The correct answer is false. You can treat most acute back pain with over-the-counter pain relievers such as ibuprofen (Motrin) or acetaminophen (Tylenol). If these medicines don't provide enough relief for your back pain, ask your doctor if there's another medicine you can take. Your may need an injection in your spine if your back pain doesn't improve. The correct answer is true. If your back pain doesn't get better with other treatments, your doctor may recommend an injection in your spine. This delivers powerful medicine that reduces swelling in the spine. If other methods haven't worked, ask your doctor if this treatment is an option for you. You'll need surgery if your pain doesn't get better in 12 weeks. The correct answer is false. Back surgery may be recommended only when you have nerve damage or have had back pain that doesn't improve after a long time with other treatments. Work with your doctor to try other treatments first. You should call your doctor when you have this back pain symptom. The correct answer is any of the above. Also call if you have been losing weight without trying, back pain has lasted longer than 4 weeks, or you have had back pain before, but this time feels worse or different. 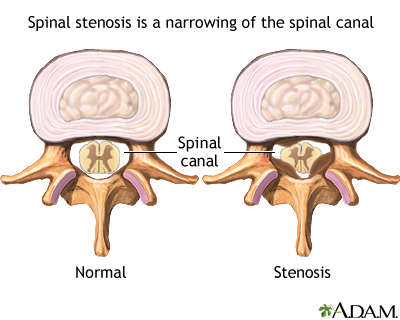 Spinal stenosis is narrowing of the spinal canal. This can develop as you age from drying out and shrinking of the disk spaces. (The disks are 80% water.) If this happens, even a minor injury can cause inflammation of the disk and put pressure on the nerve. You can feel pain anywhere along your back or leg(s) that this nerve supplies.